The Avrocar was the brainchild of John Frost, an aeronautical engineer at the Malton-Toronto plant of Avro Canada, who conducted studies in the early 1950s on extremely unorthodox vertical-take-off aircraft, beginning with one design that looked like a shovel blade named the "Avro Ace" or "Project Y-1". and then moving on to saucer-shaped aircraft, originally designated "Project Y-2". Frost felt that such vehicles could offer vertical take-off capability as well as high-speed forward flight. The US military became interested, leading to the award of a US Air Force contract in 1955 for experimental development that evolved through various designations such as "Project Silver Bug", "Weapons System 606A (WS-606A)", "Research Project 1194", and so on. The whole project was originally kept a deep secret since it was felt to be a major potential breakthrough. After considering and eliminating a number of different configurations, the effort focused on development of a proof of concept vehicle named the "VZ-9-AV Avrocar" which was funded by both the US Army and US Air Force. It looked very much like an ordinary but greatly scaled-up modern "Frisbee" toy, 5.5 meters in diameter and 1.1 meters thick at the center (18 by 3.5 feet). There was a fan 1.5 meters (5 feet) in diameter built into a duct in the center, and two little single-seat cockpits with individual clamshell bubble canopies, and powered by three Continental J69 jet engines, which were arranged in the fuselage in a triangle around the central fan. The exhausts of the jet engines drove the fan and were also ducted around the around the edge of the Avrocar to provide lift at low speed. 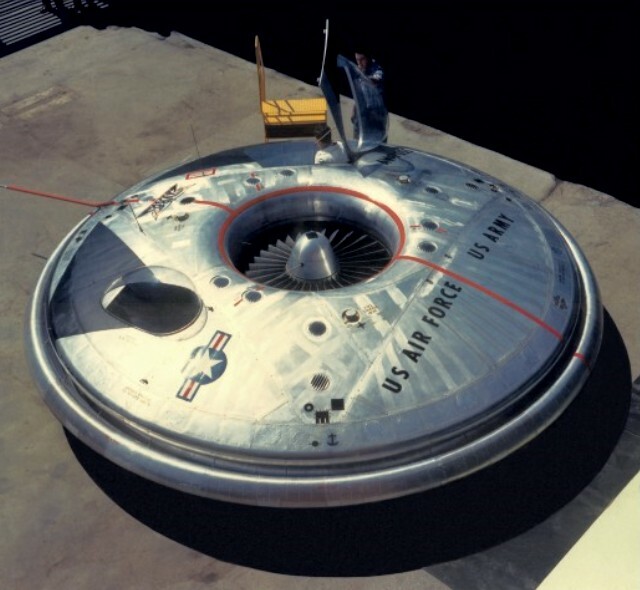 Engine thrust could be redirected to provide forward thrust, with the saucer-shaped airframe acting as a "lifting body". Differential thrust could be applied at the sides of the VZ-9 for control purposes. Frost was extremely enthusiastic about the possibilities of his flying-saucer concept, envisioning an "Avrowagon" for family use, an "Avropelican" for naval use, a scaled-up transport version, and a Mach-2 fighter-interceptor version. A wind-tunnel test model and a flying prototype were built. The test model was sent to the NASA Ames Center in California for wind-tunnel tests. First tethered flight of the flying prototype (58-7055) was at Malton on 29 September 1959, followed by the first untethered flight on 5 December 1959. After some changes to the control system, some forward flights were made just above the runway at Avro's Malton factory, starting on May 17th, 1961. The Avrocar was supposed to fly at speeds of over 483 kph (300 mph) at altitude and have a range of 1600 km (1000 miles), but the little saucer never exceeded 30.5 m (100 ft) during trials. Although Frost and his staff recognized that the Avrocar was inherently unstable and had incorporated an electromechanical stabilization system, it wasn't up to the job, and once the Avrocar picked itself up to above chest height and got out of ground effect, it bobbled around drunkenly. An improved stabilization system was considered, but Avro was in chaos due to the cancellation of the "CF-105 Arrow" interceptor program. The chaos filtered down to the Avrocar program, and the US backers of the program lost interest. The program was axed in December 1961. The flight prototype ended up on display at the US Army Transportation Museum. The wind-tunnel test model in the possession of the Smithsonian Air & Space Museum. It remains in storage at the museum's Garber Restoration & Storage Facility in Maryland.